Tips, tricks and thoughts from one writer to cyberspace . YA writer. Author of BEYOND THE RED (Skyhorse). Rep'd by Louise Fury of The Bent Agency. You asked, I answered! Today I'm talking about what to do if your WIP is coming up short—literally. Many of you asked about my writing routine! So today I'm sharing everything from where I write, to my word count goals and more. What's your writing routine like? Vlog: You Asked, I Answered 3! You've asked me questions! And while I can't answer all of them, today I've answered some of the most popular ones. Enjoy! Vlog: Ask Me Anything (About Writing) 3! Have writing, publishing, or book questions? I have answers! Ask your questions in the comments—and vote for your favorite questions. I'll pick some to answer in upcoming vlogs! Vlog: Can Books Be Scary? It's Halloween...tomorrow! So today I'm posing a question I haven't answered for myself: can books be scary? In which I get real about burn out and trying to write through it. You asked, I answered! Today I'm talking about my very first manuscript—from how it came to be to what I learned from the experience. You asked, I answered! Today I'm talking about what to do if you get stuck in the middle of your WIP...and you don't like to plot. Writing a Synopsis Before First Drafting?? You asked, I answered! Today I'm talking about the easiest way to think about writing third person when you're used to writing in first. THE RISING GOLD Pre-Order Campaign! What's this? A real blog post? Indeed! Special occasion because my third novel, The Rising Gold, will be out in just over a month and a half! And as before, there are goodies for pre-orders! Signed, very pretty bookplates for Beyond the Red, Into the Black and The Rising Gold (unless you only want one or two, in which case just let me know). The bookplates are different for each book and they are beautifulllll. 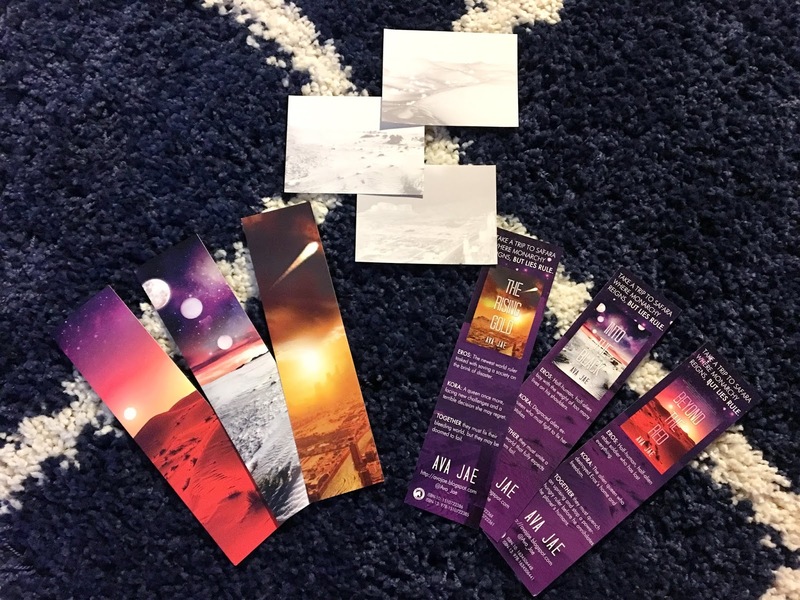 Beyond the Red, Into the Black and The Rising Gold bookmarks (again, unless you only want one or two, which is totally fine!). These are also very pretty if I do say so myself. So many things! I'm so psyched to get these goodies out to everyone and also share this book. It's hard to believe I'm actually done with this trilogy and I feel so honored to be able to share the full story with everyone. I hope you all love it as much as I do. So that about covers it! I hope you guise are as excited as I am, and I look forward to putting together pre-order goodies for everyone! So I've pre-ordered, how do I get the goodies? Glad you asked! Just e-mail your receipt and U.S. mailing address to avalonjaedra @ gmail on or before 10/1/18 at midnight EST. That's it!